I worry we've not got much cover at the back.could maitland do a job as the ball winner in the middle,has looked lot fitter this season. Tommy just needs to screw the nut a bit like Joe did last season. We've got Tommy, Craig and young Whyte at CB, so any two from three and Tommy can move into midfield if need be. For me he's at his best as #10, driving at players from deep in midfield. Alloa's seemed to play him as more of a sitting midfielder though, and he sprayed some stonking crossfield passes in the playoffs. He played a huge part in the most successful period in our recent history, and was arguably our most consistent player throughout the run from relegation certainties to an established Championship side (albeit not anymore!). I always got the feeling that the relationship between him and Stevie Aitken wasn't the greatest, and he had a few personal problems, so it wasn't a great surprise to see him move on at the end of the 2016/17 season. I wrote this for the Lennox Herald when he left. On Thursday evening Dumbarton Football Club reached the end of an era, as it was announced that long serving striker, local hero and fans’ favourite Garry Fleming would not be offered a new contract. Despite the 2016-17 season being, by a distance, his poorest at the club, the Dumbarton lad remained a hugely popular figure with fans, and played as big a role as anyone in establishing the Sons as a Scottish Championship team. Signed by Alan Adamson in the summer of 2012, Fleming’s addition was hardly one that had the Championship shuddering with fear. In fact it was one that raised more than a few eyebrows amongst the club’s own fans. 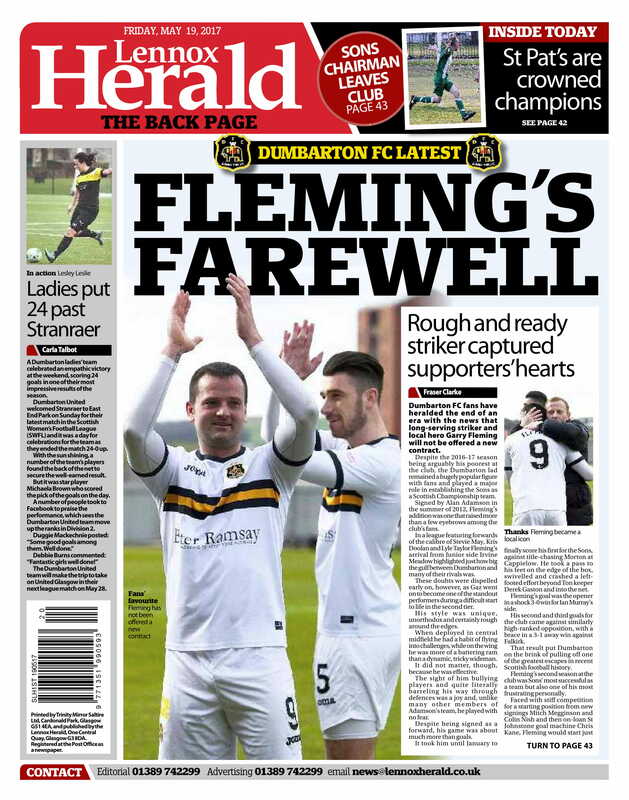 In a league featuring forwards of the calibre of Stevie May, Kris Doolan and Lyle Taylor, Fleming’s arrival from Junior side Irvine Meadow highlighted just how big the gulf between Dumbarton and many of their rivals was. These doubts were dispelled early on however, as ‘Gaz’ went on to become one of the standout performers during a difficult start to life in the second tier. His style was unique, unorthodox and certainly rough around the edges. When deployed in central midfield he had a habit of flying into challenges, whilst on the wing he was more of a battering ram than a dynamic, tricky wideman. It didn’t matter though, because he was effective. The sight of him bullying players, and quite literally barreling his way through defences was a joy and - unlike many other members of Adamson’s team - he played with no fear or respect. Despite being signed as a forward, his game was about much more than goals. It took him until January to finally score his first for the Sons, against title chasing Morton at Cappielow. He took a pass into his feet on the edge of the box, swivelled and crashed a left-footed effort beyond ‘Ton ‘keeper Derek Gaston and into the net. Fleming’s goal was the opener in a shock 3-0 win for Ian Murray’s side. His second and third goals for the club came against similarly high ranked opposition, with a brace in a 3-1 away win against Falkirk. A result that put Dumbarton on the brink of pulling off one of the greatest escapes in recent Scottish football history. Fleming’s second season at the club was Sons’ most successful as a team, but also one of his most frustrating personally. Faced with stiff competition for a starting position from new signings Mitch Megginson and Colin Nish, and then on-loan St Johnstone goal-machine Chris Kane, Fleming would start just 15 matches in the newly renamed Championship. Despite this he managed to score seven goals, including winners against Queen of the South, Falkirk and Hamilton. His performances became more rounded, and his movement suddenly began to resemble that of an outright goalscorer. 2014-15 saw him return to the starting fold, and finish as the club’s top goalscorer - albeit with just six goals. Ian Murray’s last campaign saw a change in ideology, from an attacking ‘you score four we’ll score five’ approach, Dumbarton became more cagey and defensive. New signings Archie Campbell and Chris Duggan lacked the quality of their predecessors, and that put a heavy burden on Gaz to provide the goals. Despite only scoring six times, three of them were as important as they were impressive. A stunningly powerful free-kick in a crucial 3-1 away win over Cowdenbeath days after Christmas was the perfect late present, whilst two late volleys against Livingston in November and March gave the Sons vital away wins. Murray’s departure to St Mirren in the close season saw Fleming offered full-time football with the Saints. It was a move he turned down, something St Mirren must still regret! His career under Stevie Aitken started poorly. Substituted against East Fife, Fleming was visibly angry with the decision, and stormed down the tunnel. It was an early test for the relationship of player and manager. How would Aitken respond? He did so by handing Fleming the captain's armband for the opening league game of the season against Hibernian, an opportunity he relished, leading by example in a famous 2-1 victory. The following week he showed nerves of steel to bury a late penalty winner against St Mirren. It wouldn’t be the first winner he’d grab against the club who were desperate for his signature just a few weeks earlier either. Having set himself a target of reaching double figures in goals early on in his Dumbarton career, Fleming finally reached it in 2015-16. His 11 strikes featured one of the most memorable in recent history. Knowing that a win was needed to secure survival, Dumbarton welcomed neighbours St Mirren to the Rock in April 2016. Future Son Calum Gallagher gave the Buddies an early lead, before Keith Watson turned Mark Docherty’s cross into his own net just before half-time. Then, ten minutes into the second-half, came the defining moment of his Dumbarton career. Jamie Lindsay’s pass deflected up off Stevie Mallan, and dropped towards Fleming. As the Rock collectively held its breath he unleashed the perfect dipping volley from the edge of the box, an effort that flew over Jamie Langfield and right into the top left-hand corner of the net. It was a goal that he will always be remembered for. This season was a frustrating one for Garry, and something just didn’t look right. He was lacking sharpness, fitness and, above all else, that little bit of fire that had been the hallmark of his time in white and gold. He still contributed crucial goals, another winner against St Mirren, and match winning efforts against Queen of the South and Falkirk - but something just didn’t feel right. Fleming started just 19 games, with the form of Robert Thomson and Christian Nadé limiting him to just one since January. His final goal for the club, against Raith Rovers in March, encapsulated him perfectly as a player however. Heading for the corner he quickly changed his mind, drove through three challenges and beyond the ‘keeper before planting the ball in the bottom corner. Garry leaves the club having made a total of 179 appearances, grabbing 33 goals. Wherever he goes next he’ll always be most welcome back at the Rock, and will be forever remembered as a true modern day Dumbarton icon. Enjoyed that, thanks for sharing. Looks like Buffs have got ourselves a good one. Surely Monday 30th July ? How has Gary Fleming looked for you guys?? He's a class act at this level. Just the type of quality player that we need to push on this season. Mckenzie has been very sharp, shoots on sight. Fleming needs a few games,carrying bit o timber,but looks as if he could be handy in a few different position.spoiled 4 choice up front now with McKenzie,nisbett, boylan n Monti. Haven’t they only signed two players??? And lost a few so surly the players who left need to be replaced that doesn’t mean spending loads. Fortunate that the Beith squad play for nothing but the love of the club. Same as talbot then or so there fans always say.